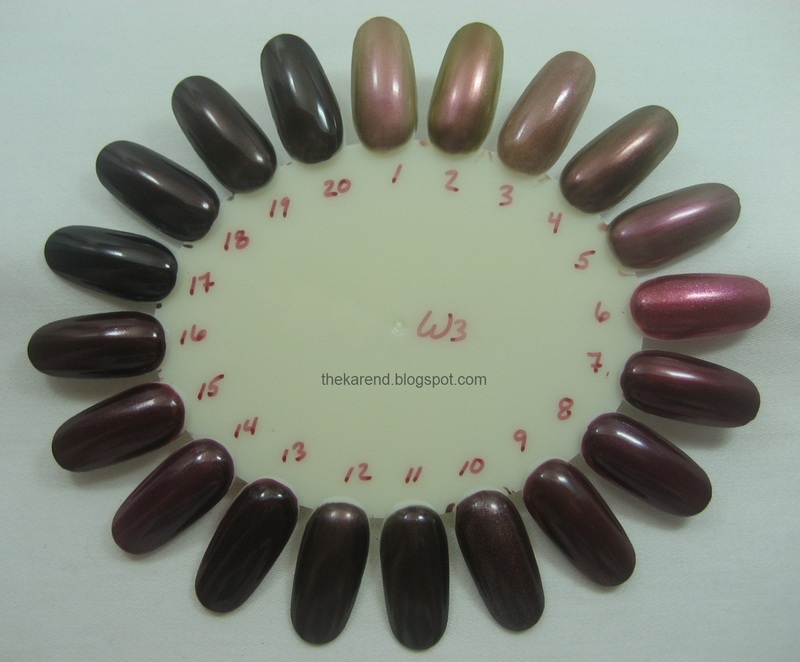 This is a wheel I did when I'd (temporarily) worked down my unswatched reds to a point where some not-quite-red ones had to join my dark shimmers to fill out a wheel. Monday is a holiday here, and I'm turning it into a very long weekend. I'll likely pop up online in short spurts depending on the weather (too hot? time to internet in the air conditioning) and how lazy I'm feeling, but most likely won't be back with a new post until Tuesday. Enjoy Labor Day, those of you who get it off! 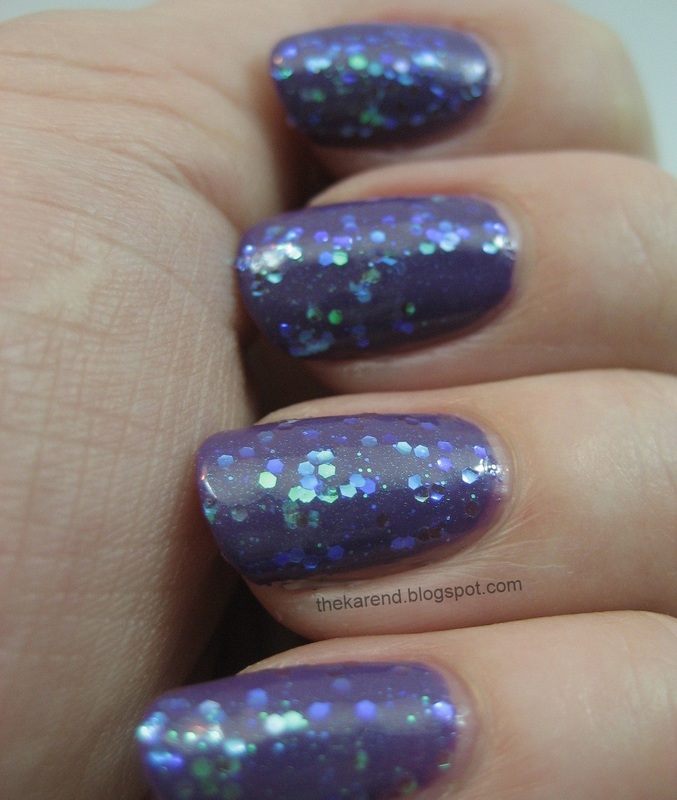 As I teased this one on my Google+ and Facebook pages last week, here's Revlon Sparkle Aplenty, from the single-shade Runway Report display that's in stores now. 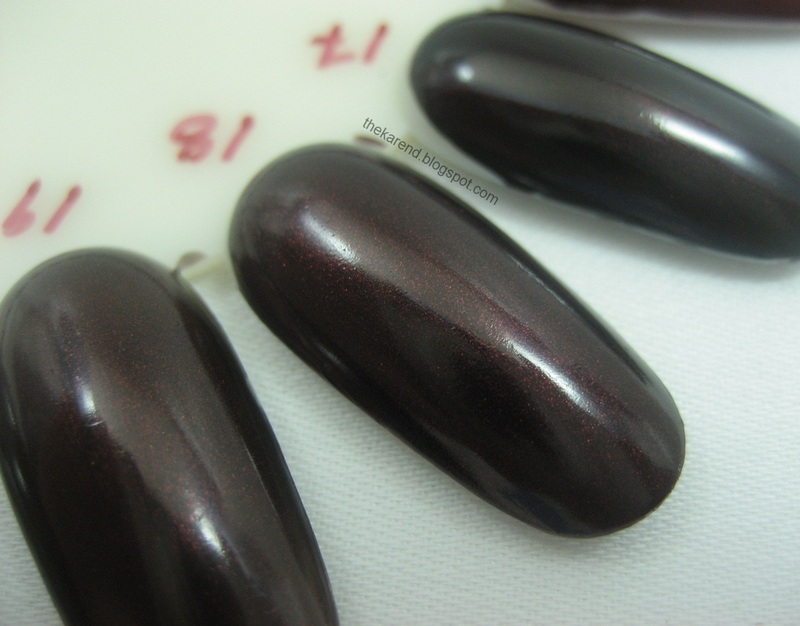 It's a black jelly base that has black and silver hex glitter and black and silver tiny glitter. 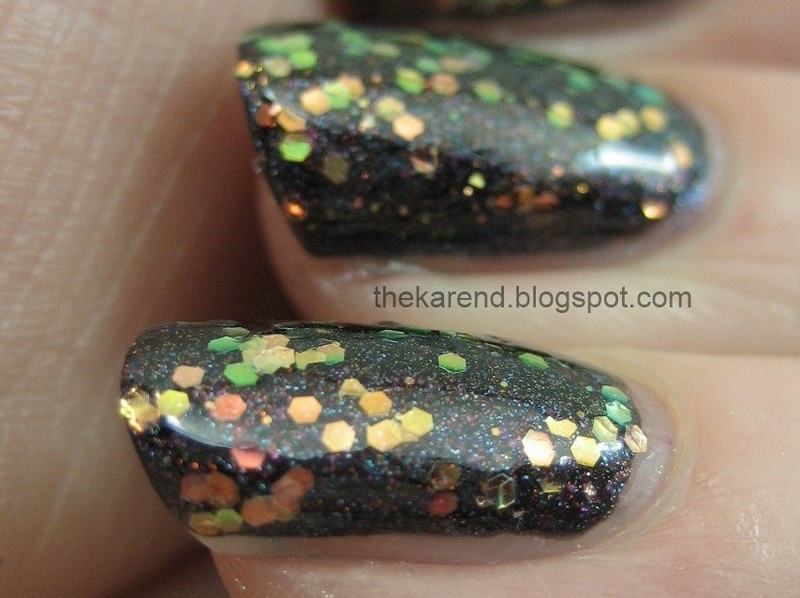 The black glitter gets rather lost in the mix on the nail. 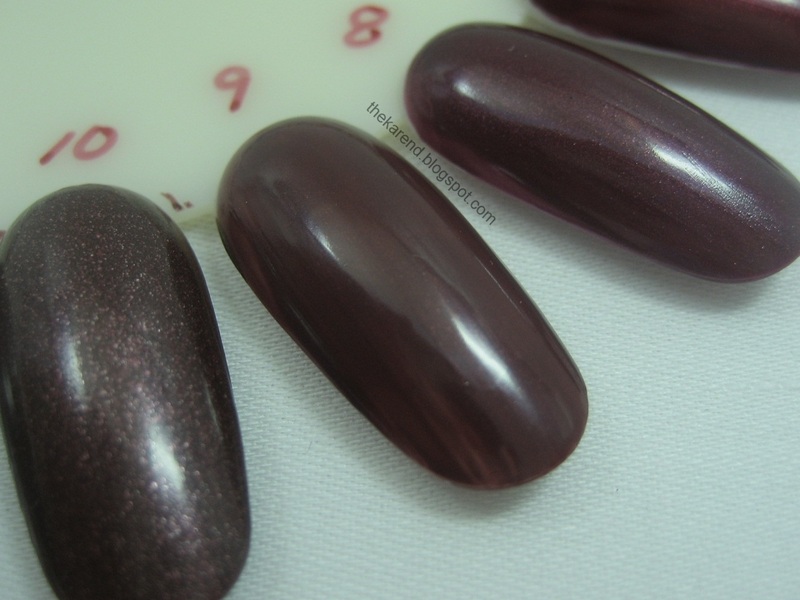 I used three thin coats plus one layer of topcoat; next time I'll either use a thicker topcoat or an additional layer, as it still looked a bit bumpy to me. 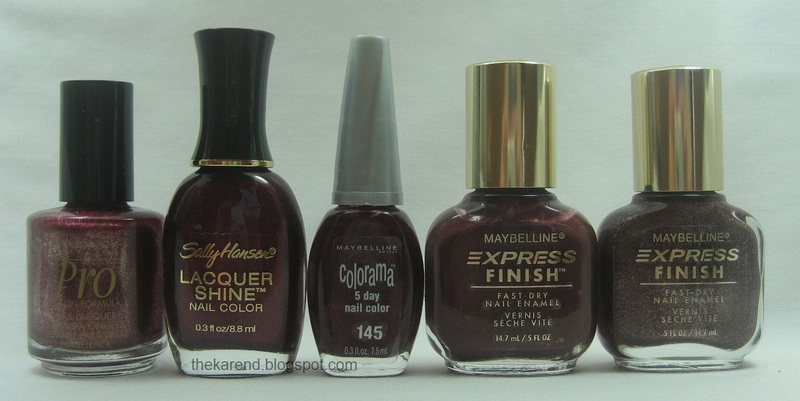 There's a comparison of this with OPI Metallic 4 Life on Nouveau Cheap; they're not dupes but it is a similar effect. I guess it shouldn't surprise me that Revlon is doing stuff like this since they did bring us Street Wear and other good things way back in the day, but I'm still pleased to see it. P.S. Just wanted to let those of you with AdBlock turned on that the box at the top is for a contest to win one of five $100 gift cards from Walgreens. That's a lot of polish if you win. 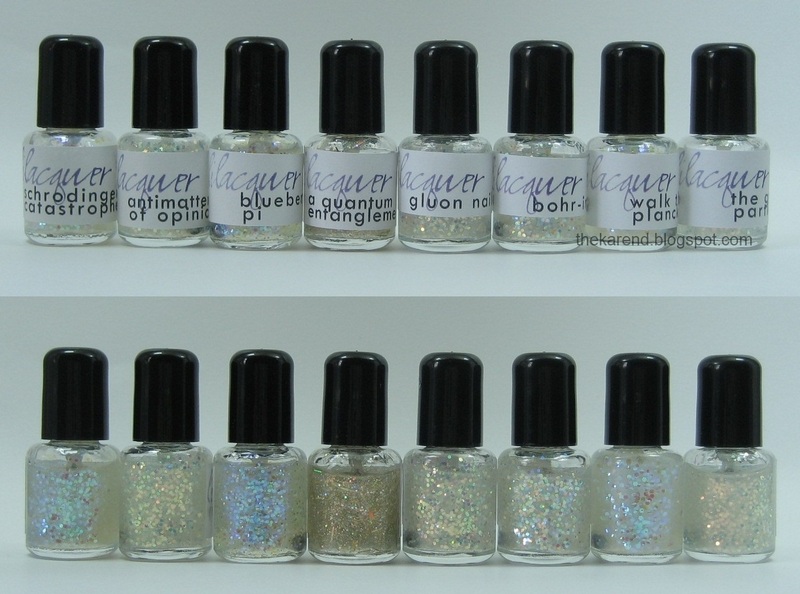 My friend who's the creative force behind Lilacquer Polishes surprised me with a full set of minis of her new Science collection, eight duochrome glitter topcoats with science-themed names. She's releasing one every other week; the first two are out now, with the third coming this Friday. She said it was okay to share them all now, so that's what I'm doing. Here are the bottles, front and back. 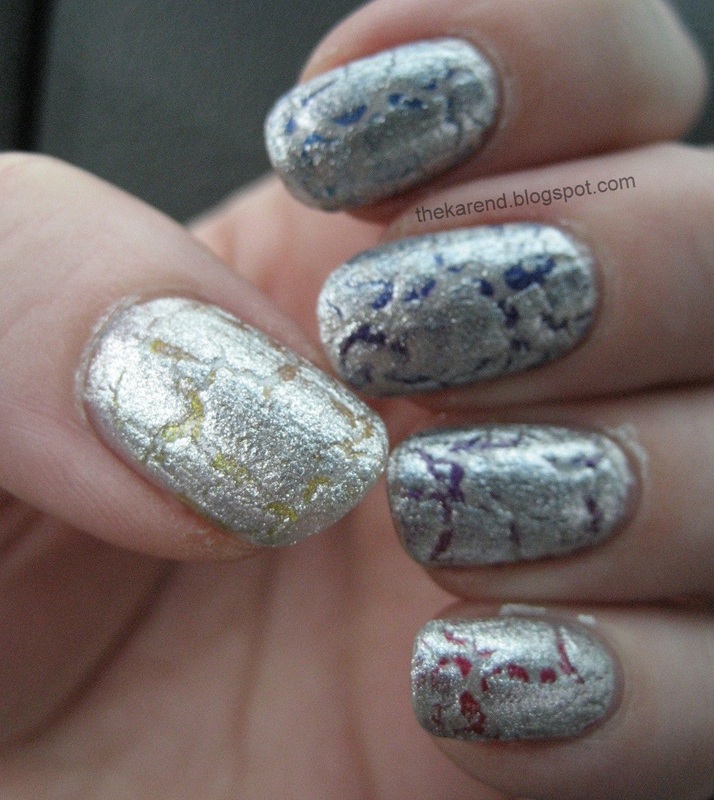 I started with Schrodinger's Catastrophe, which I layered over OPI Funky Dunkey. 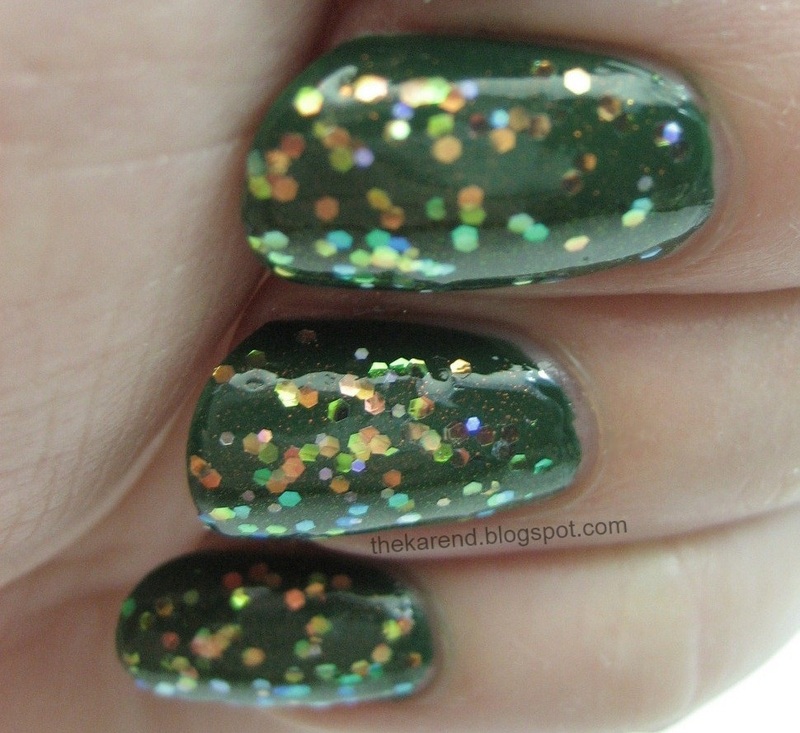 This has medium and small glitter and fine shimmer, all of which shift colors, mostly in the blue to green range. 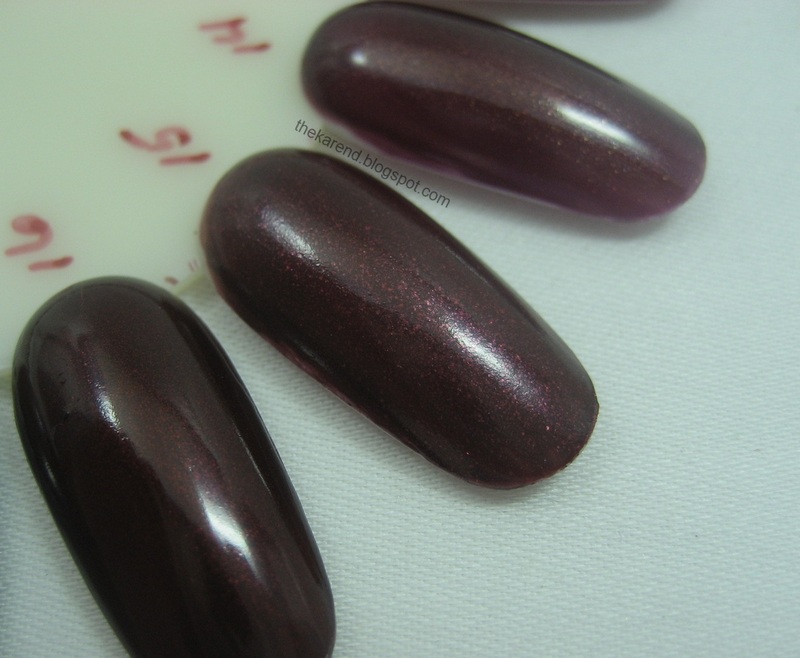 This one is available now at Lilacquer's etsy store. 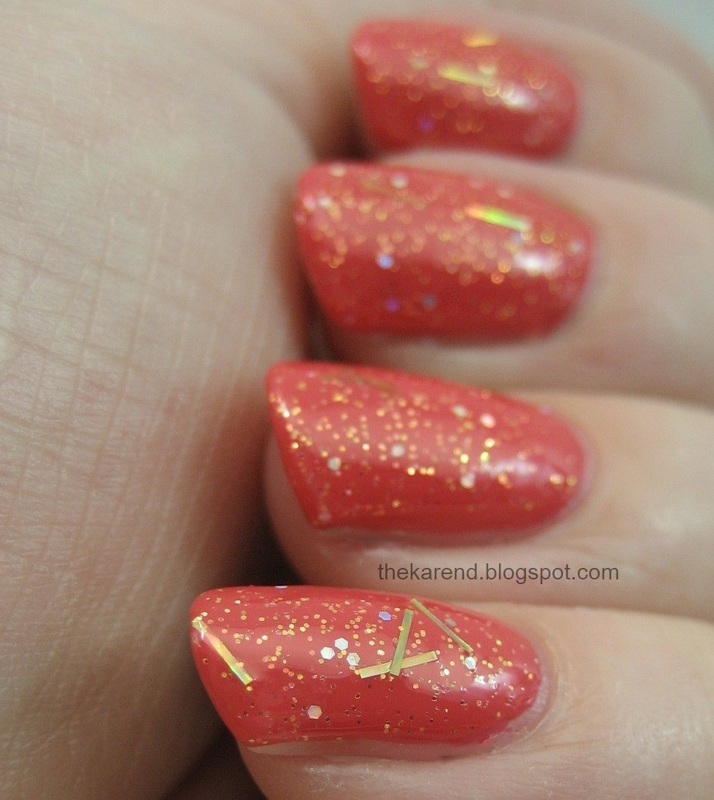 The swatch above is without topcoat; these glitters lay pretty flat. I did add a few drops of thinner to all my bottles. I don't consider this a problem or imposition; having thinner on hand is just part of being a lacquer lover, like having seasonings on hand is part of being a foodie. 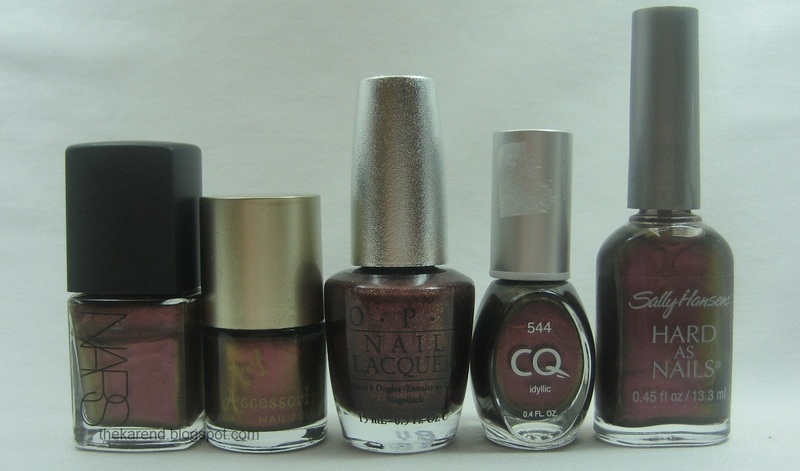 For the rest of these swatches, I did add a layer of topcoat (except where noted, but that's much later). 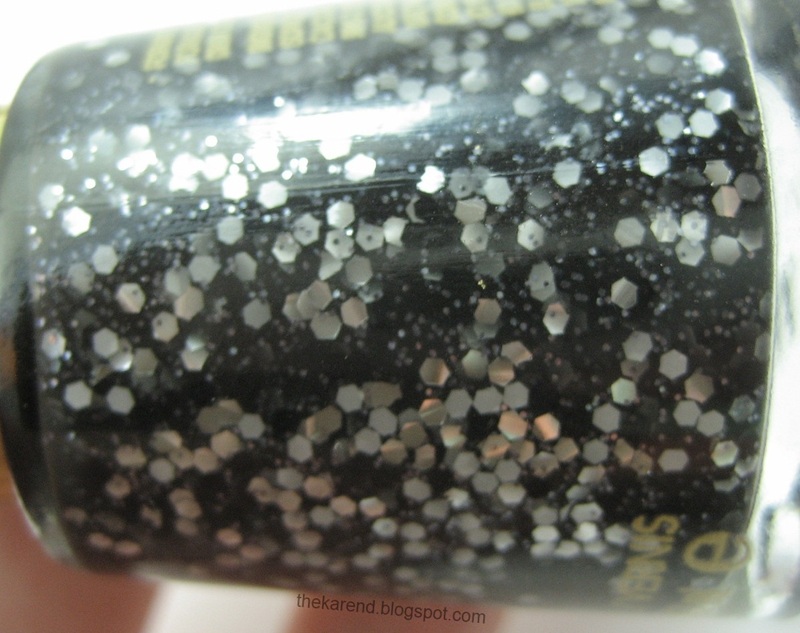 I was intrigued to see the pink and yellow showing in the bottle; these are very interesting glitters indeed, and I can see myself doing lots of experimenting with them over different base colors. These are also fun to look at in different lights at different angles; below you can see the hexes all went blue/blurple when I tipped my fingers this way. 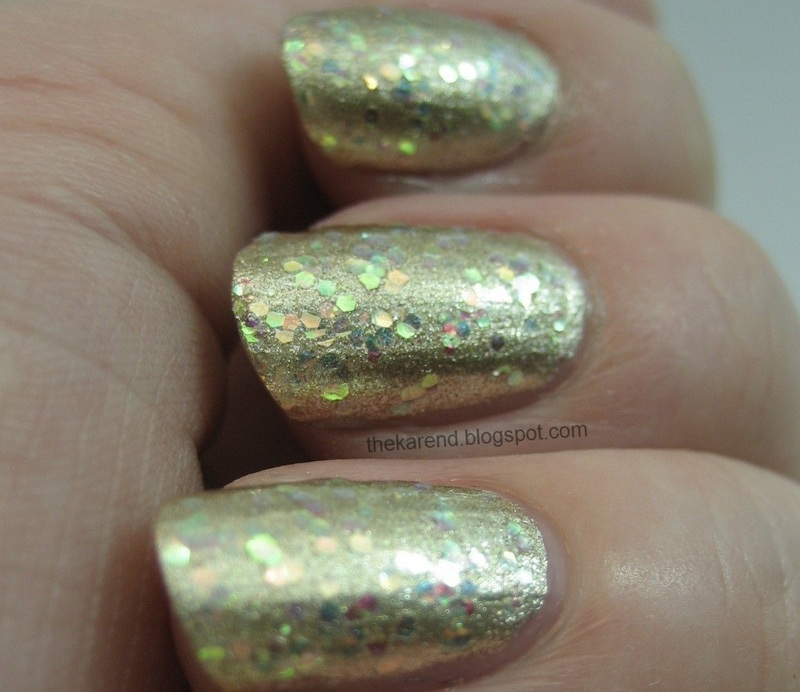 I decided to try Antimatter of Opinion (available now) over a gold foil, Milani My Network. I don't wear a lot of gold, but I love this combination. 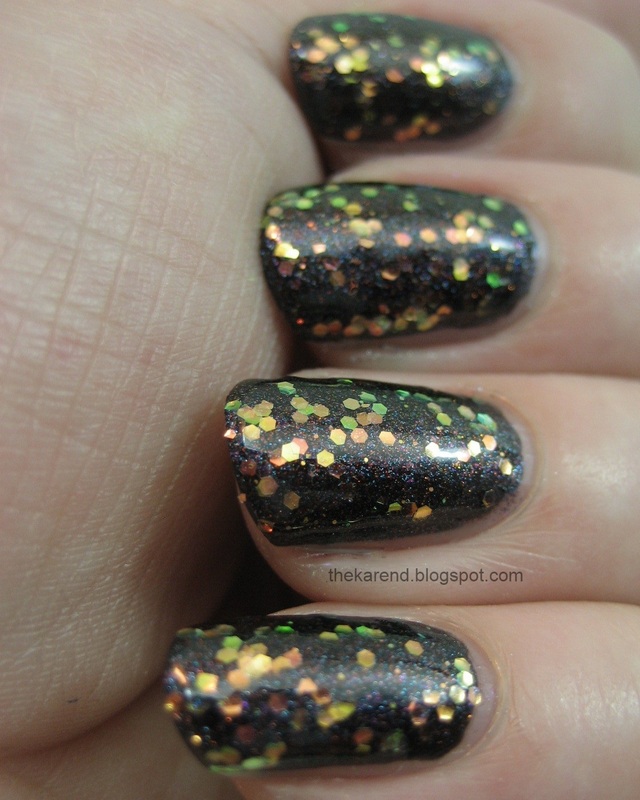 The shimmer in Antimatter did get lost against the foil, true, but the colors in the glitter looked so good I didn't mind. They mostly showed lime and gold, but also a soft orange and even deep pink or teal depending on the light and angle. 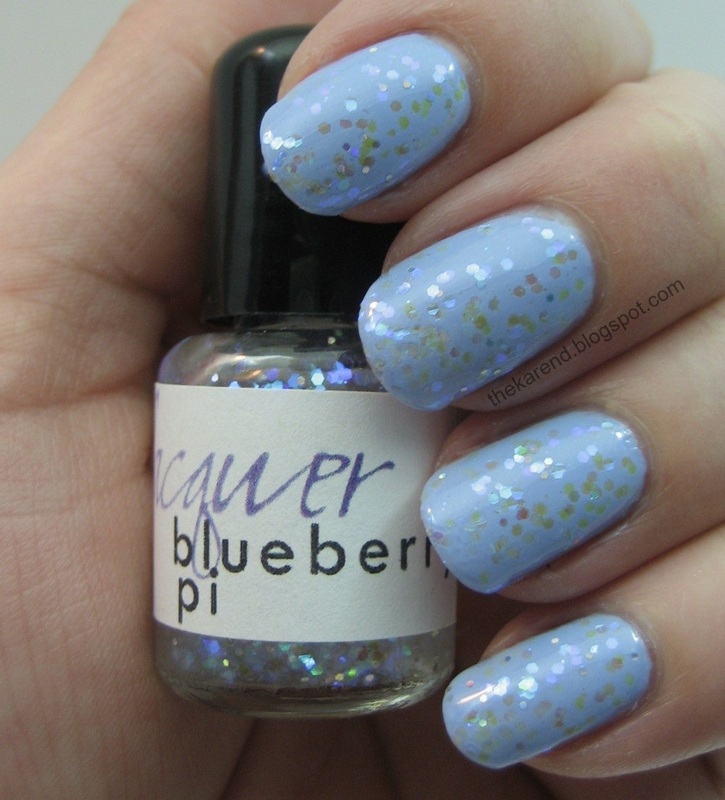 It's been way too long since I had Essie Bikini So Teeny on my nails, so that's what I used as a base for Blueberry Pi (release date: August 31). 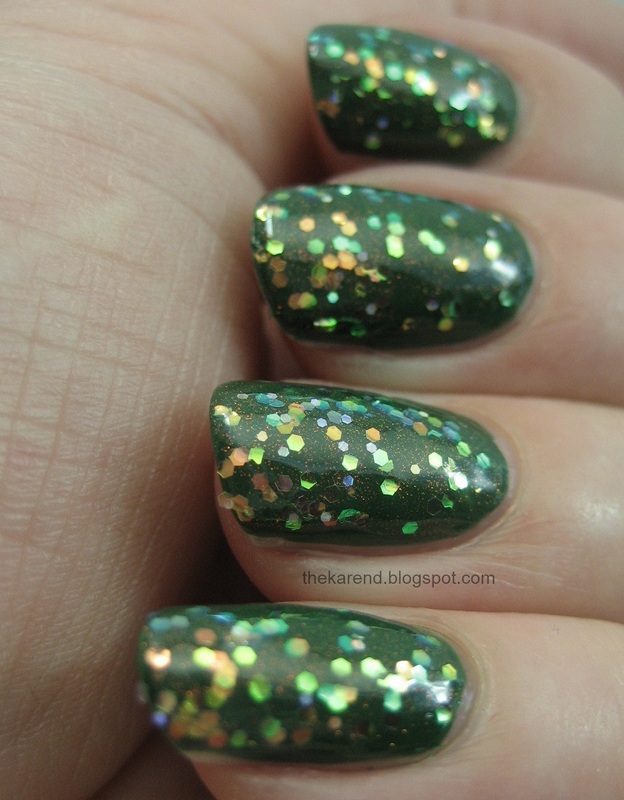 The surprise here was how much spring green the glitter showed; I could also see aqua and blue and even pink. 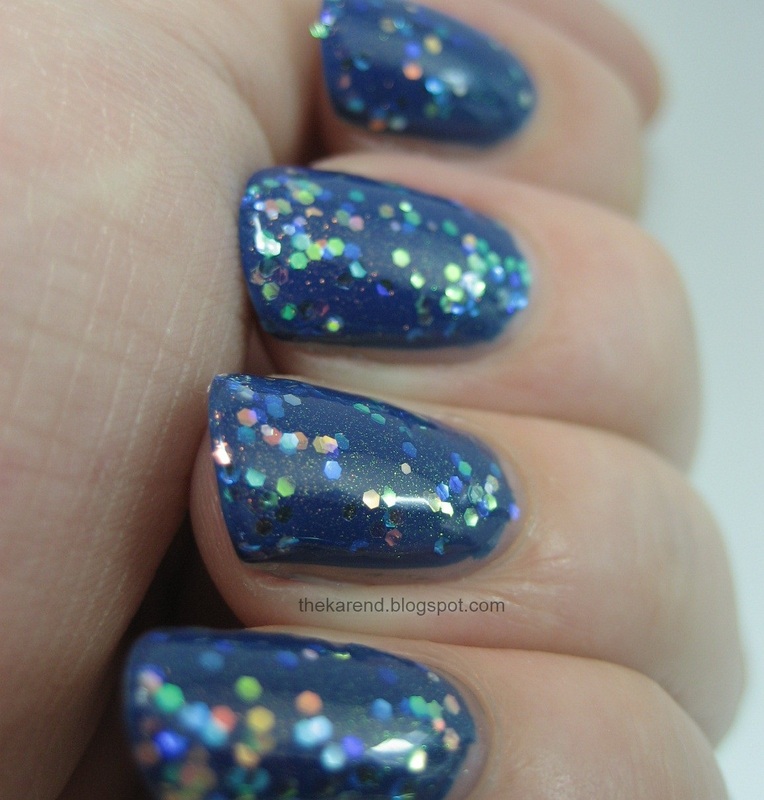 A Quantum Entanglement (release date: September 14th) is the only one of the group with bar glitter, which is a nice bit of variation. 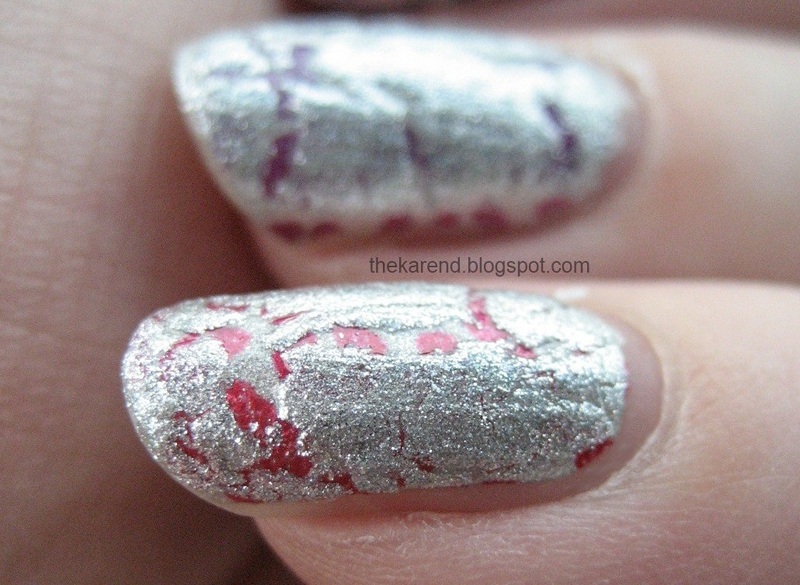 I tried this over a coral creme, Wet 'n' Wild Wild Shine Candy Apple Twist. The shimmer sparked orange and gold, bars were gold or rainbow depending on the light, and the little hexes were mysterious—I couldn't figure out if they were silver or purple or blue or what. 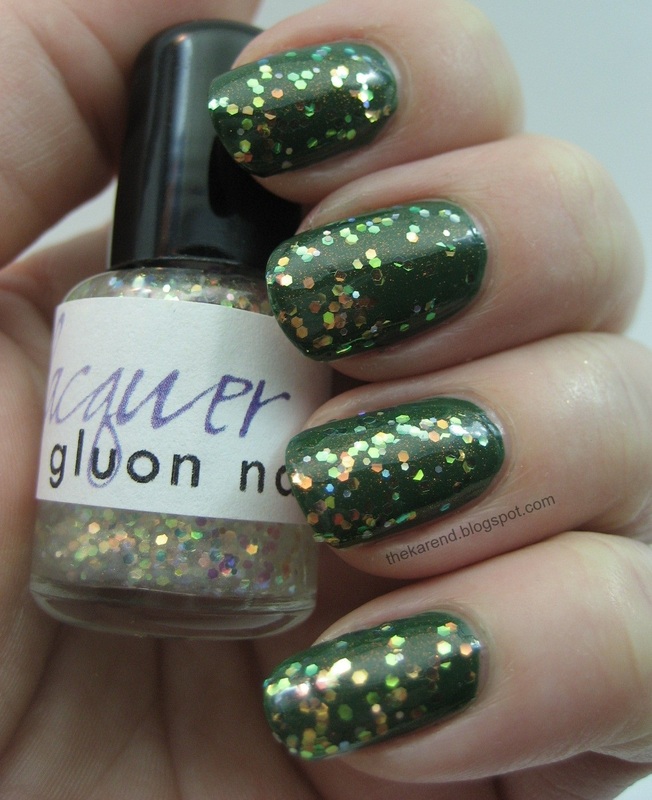 Orly Wandering Vine was my base for Gluon Nails (available September 28). 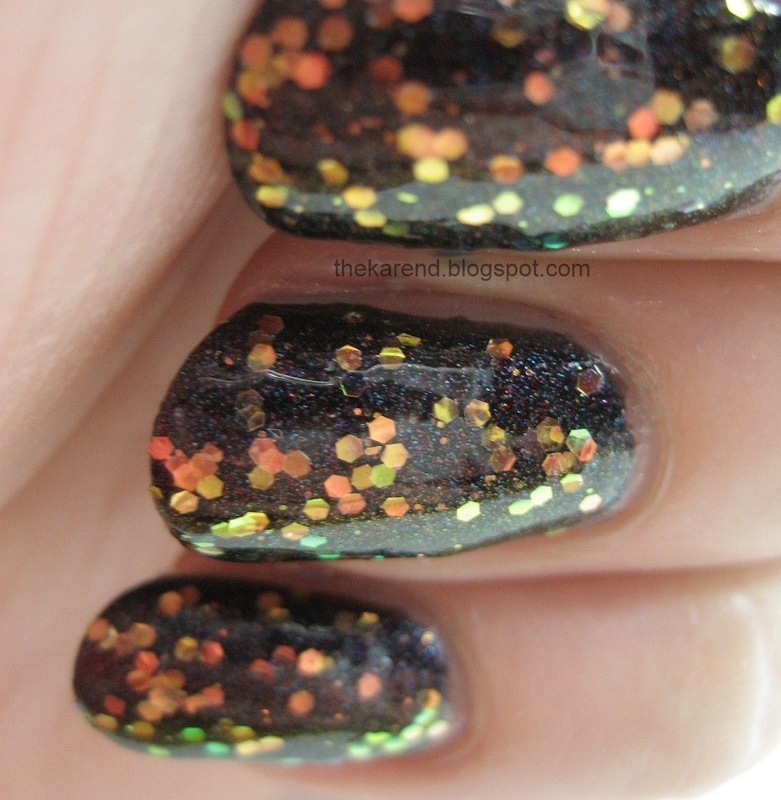 I think this is what autumn would look like if leaves were made of glitter—so pretty! 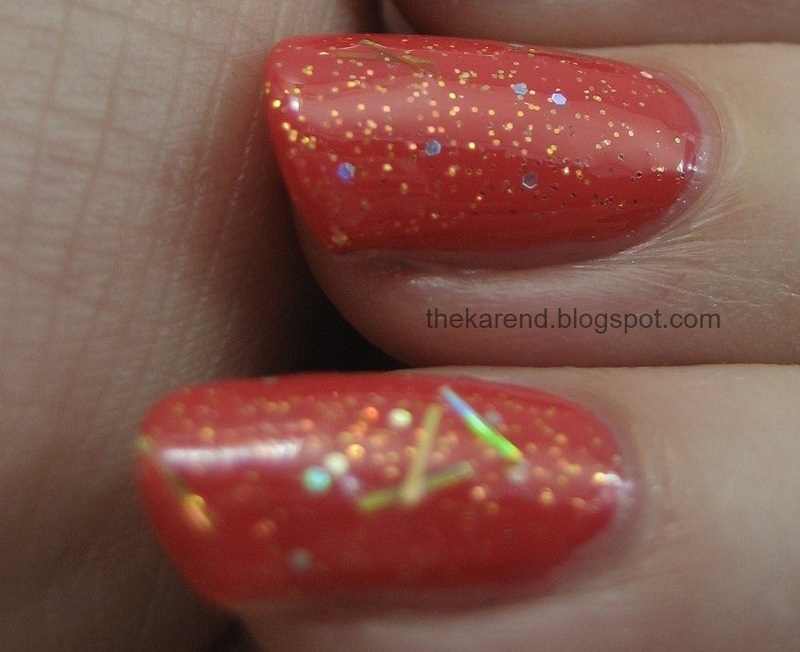 The shimmer mostly stayed in the orange to red range, providing a backdrop for the glitter, which put on a show of green and gold and orange with accents of blue. 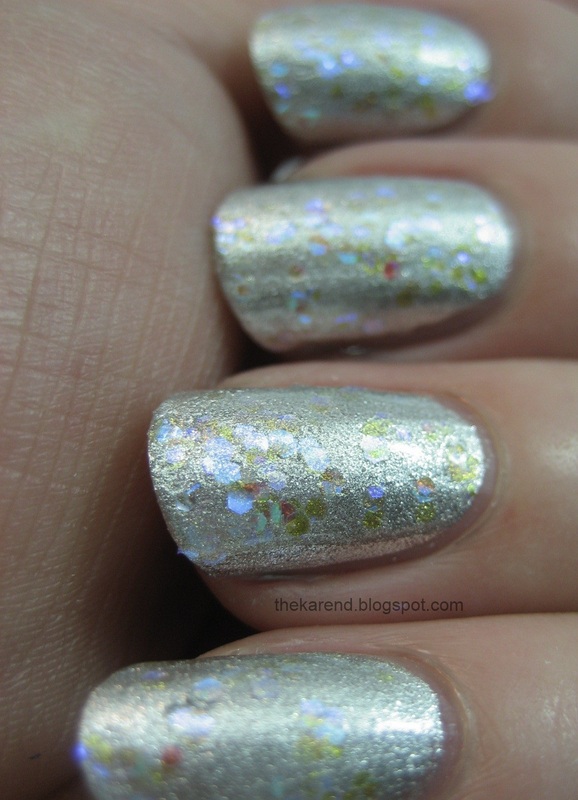 Bohr-ing (available October 12th) came next, layered over Orly Shockwave. This was a carnival of color; the shimmer shifts from red orange to green and the glitter is a party with red and green and blue and yellow. 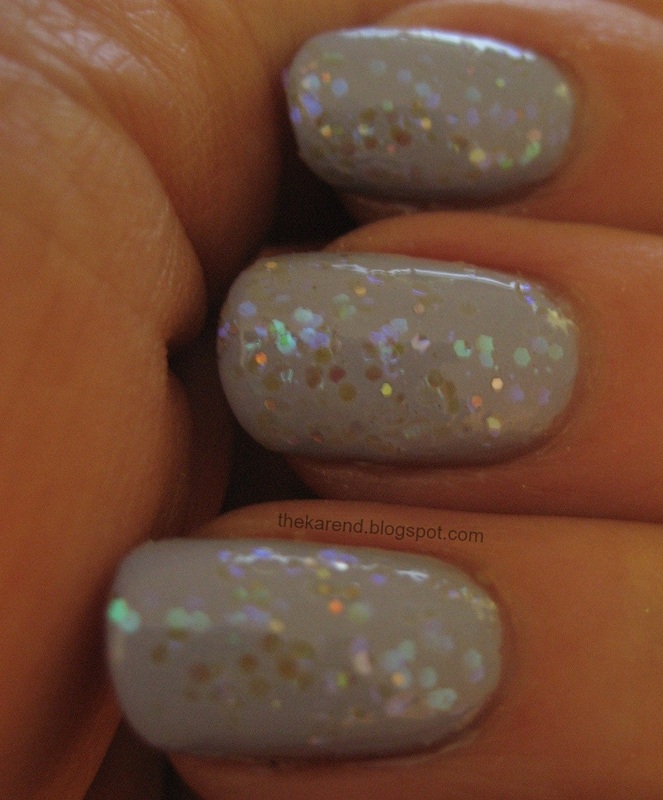 I put Walk the Planck (available October 26) over Nicole by OPI Give Me the 1st Dance. 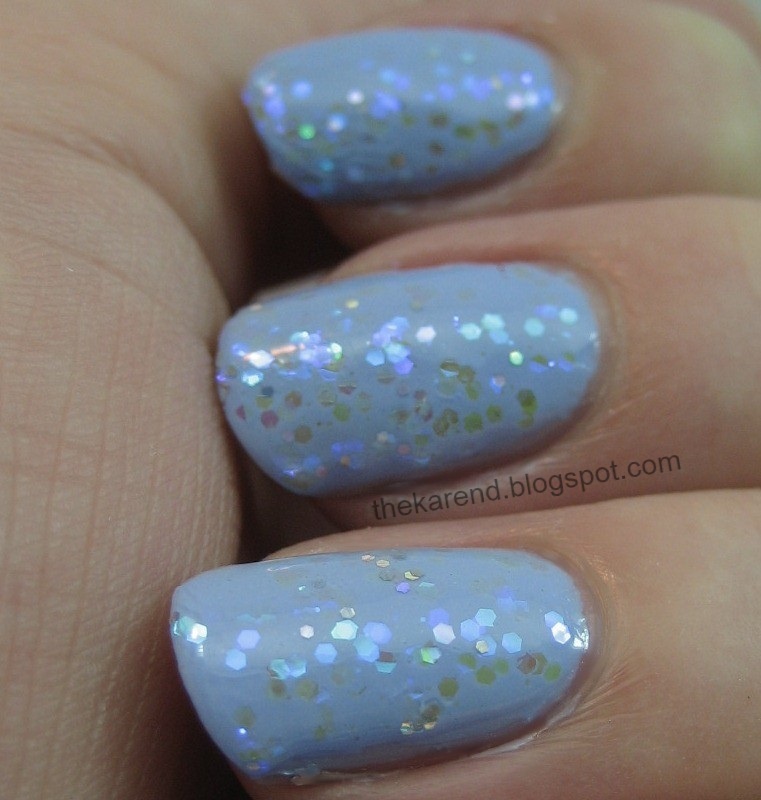 As with the gold above, the foil overwhelmed the shimmer in the Lilacquer, but it brought out some interesting colors in the glitter: perwinkle and aqua and pink and acid yellow. Here's a bonus of Walk the Planck over Essie Blue Rhapsody. 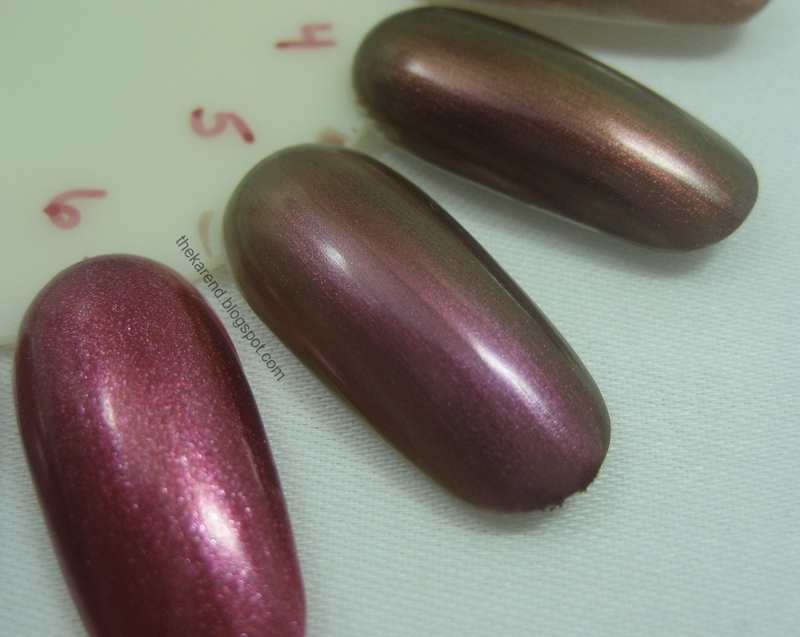 I didn't let the Essie dry long enough before I started in with the Lilacquer, which made a mess, which I tried to fix with topcoat, which bubbled, so I decided it was not meant to be and started over with the silver base, which as you saw worked much better. 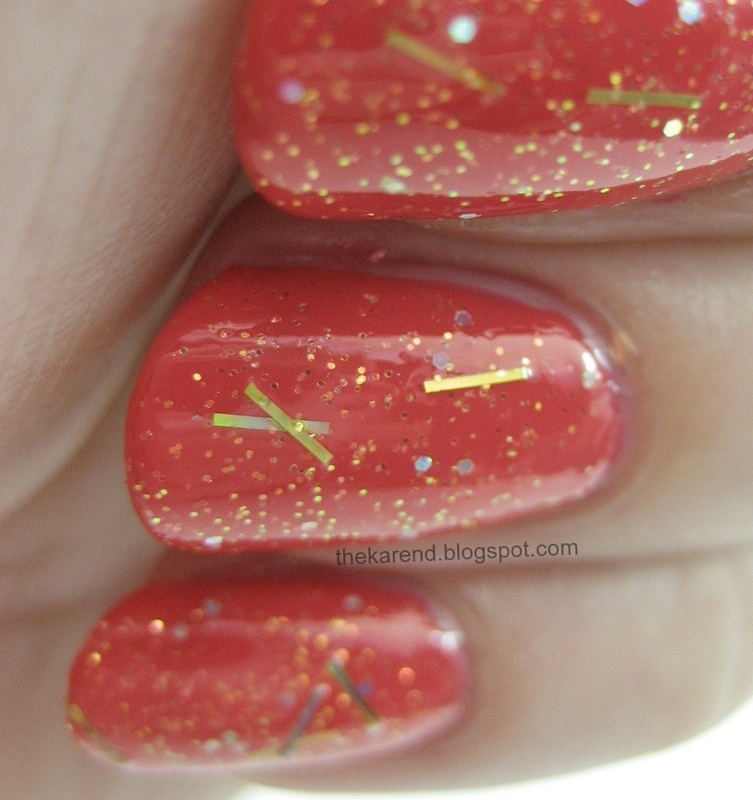 The God Particle (available November 9th) completes the set; I layered it over Orly After Party. 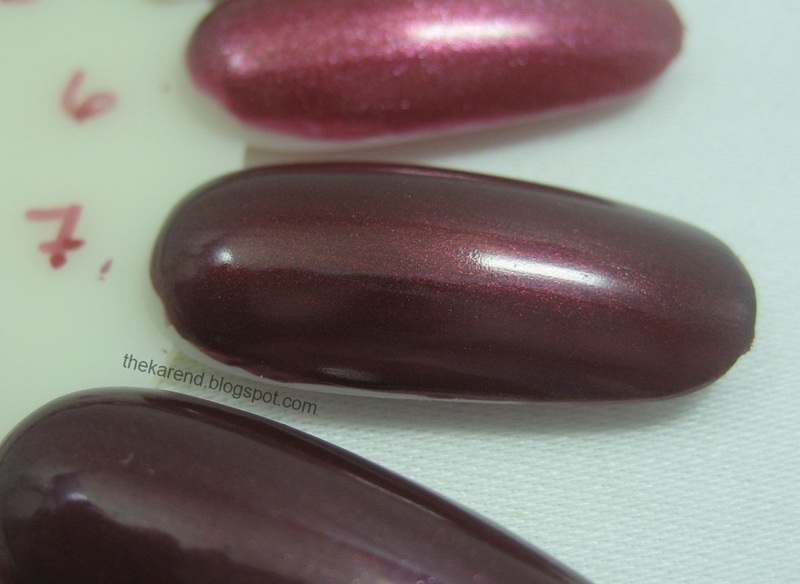 The blue and pink shimmer you see is coming from the Orly; the autumnal blingy goodness is coming from the Lilacquer. Because I just couldn't resist playing with these some more, I did Skittles, first over Sally Hansen Insta Dri Whirlwind White (a creme) and then over Sally Hansen Complete Salon Manicure Sequin Scandal (a shimmer). Left to right in two photos below: Schrodinger's Catastrophe, Antimatter of Opinion, Blueberry Pi, A Quantum Entanglement. Change the angle and color shifting happens—the pink and yellow in Schrodinger's Catastrophe turn periwinkle and aqua, for instance. 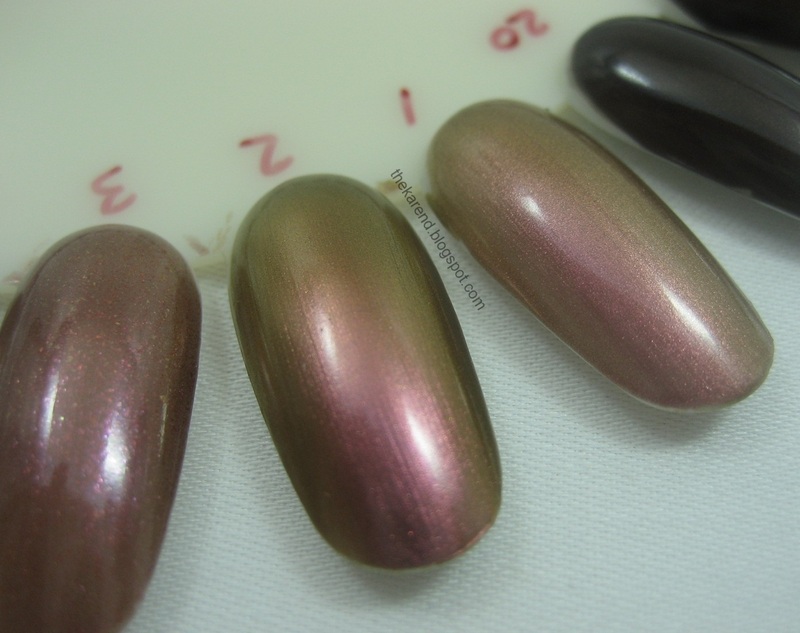 I swear these are the same four polishes layered on top in both pictures, though I know it doesn't look like it. 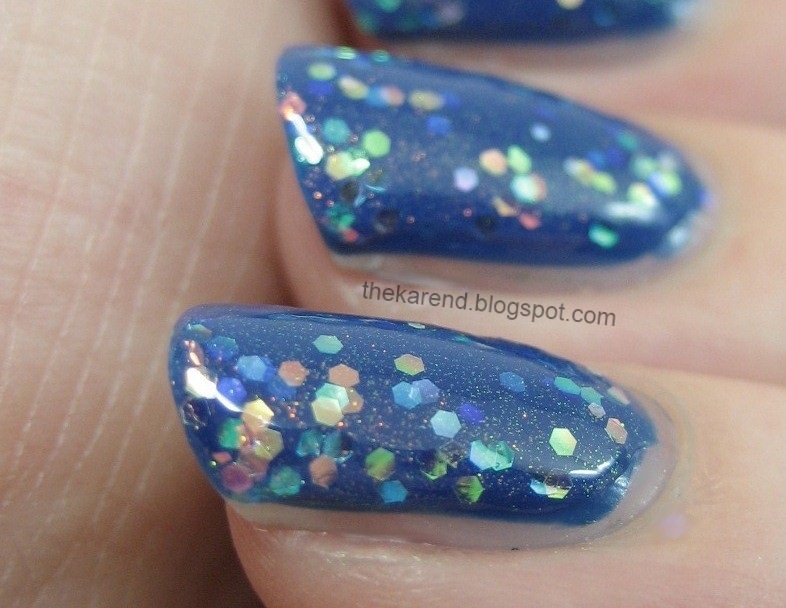 These are some crazy wonderful glitters for sure. Here are the other four, over the same two bases. 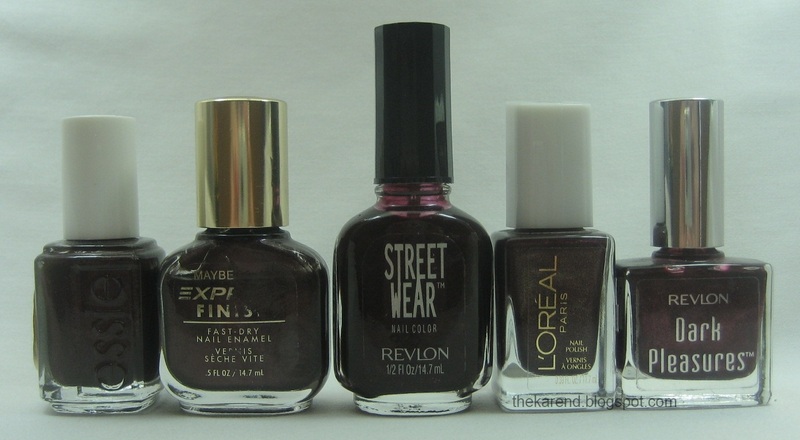 Left to right: Gluon Nails, Bohr-ing, Walk the Planck, and The God Particle. 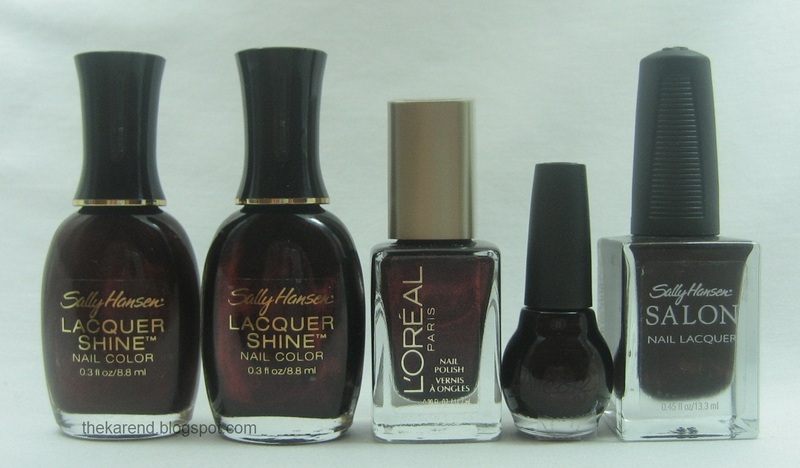 To see even more variations from these interesting Lilacquer Polishes, go look at Cilucia's swatches on Spazz & Squee. 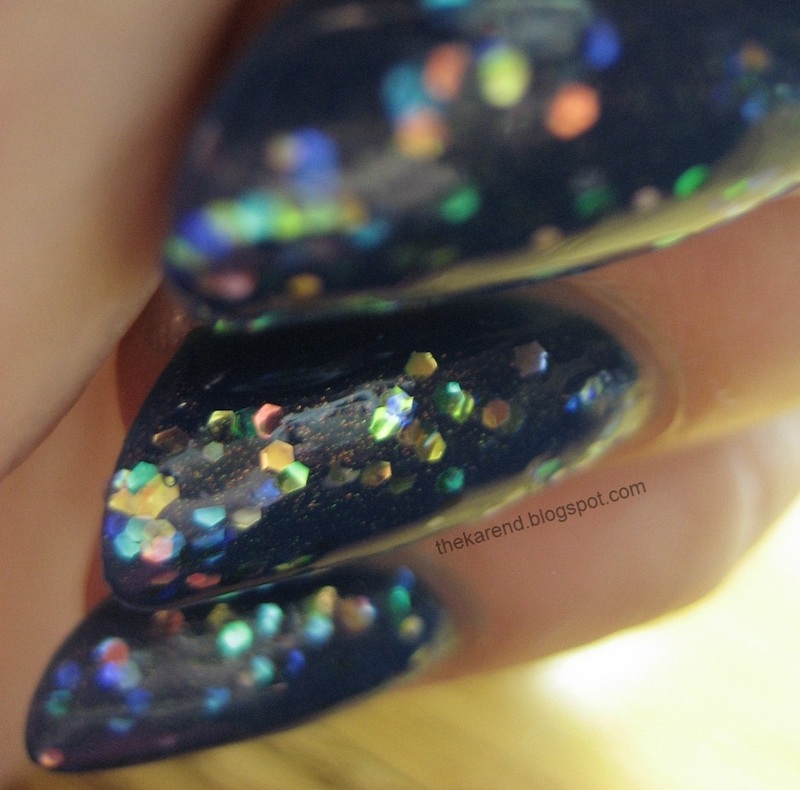 She used some different base colors than I did, including black, and has some great closeups. I've been going Salon Effects crazy lately; my last four manicures have been done with these strips. There are various reasons for this, some of which I'm sure I've mentioned in other entries about these. Partly it's because I've been busy and haven't had time for mid-week polish changes, which means I feel like I'm getting more value from them. Partly it's because I realized I've accumulated quite an inventory or strips; all that grabbing a box or two nearly every time I see them on sale adds up. Partly it's because they travel well; I can put a them in my carryon and not run afoul of the TSA's liquids rules (remover pads take care of getting them off again, though I have been known to buy a small bottle of remover when I get where I'm going, too). Partly it's because I can put them on right before bed. Partly it's because I just like the designs, which are almost always something I couldn't get on my nails any other way, being not so skilled at freehand art and impatient besides. The first set of strips I used was Purr-fect Harmony, from the limited edition Avril Lavigne collection which came out early this year. 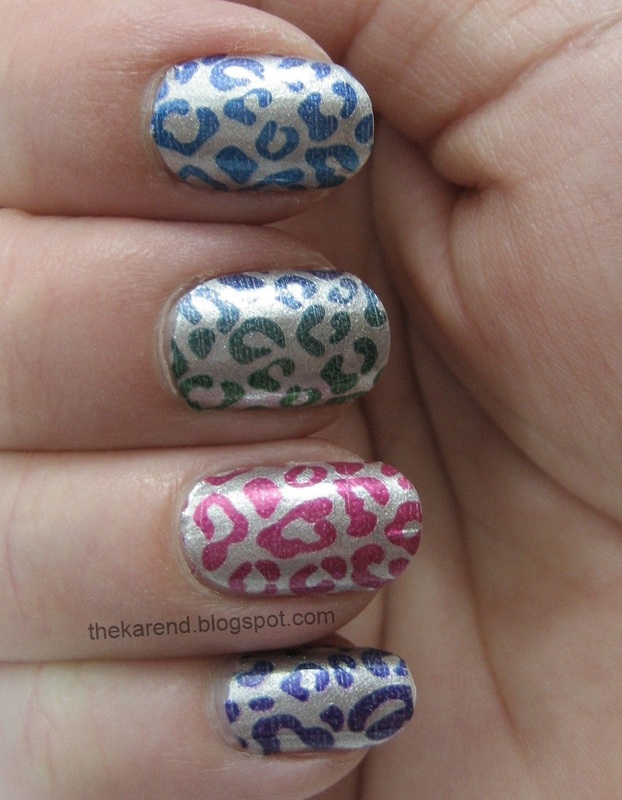 This design is a leopard print in a gradation of rainbow colors on a silver background. 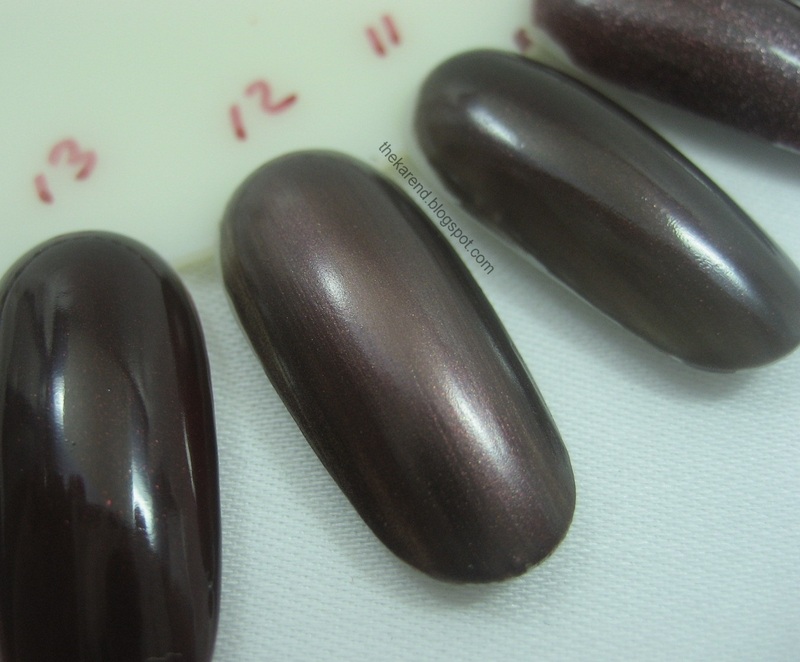 The gradation pattern is pretty large scale and runs side to side, so most nails end up being just one color. On my left hand, I managed to get something of a rainbow going, moving from blue on my index through indigo and violet ending up with red on my pinky. My left thumb was yellow and orange. On my right hand, things were more random, since I had a smaller number of strip sizes and colors to work with at that point. 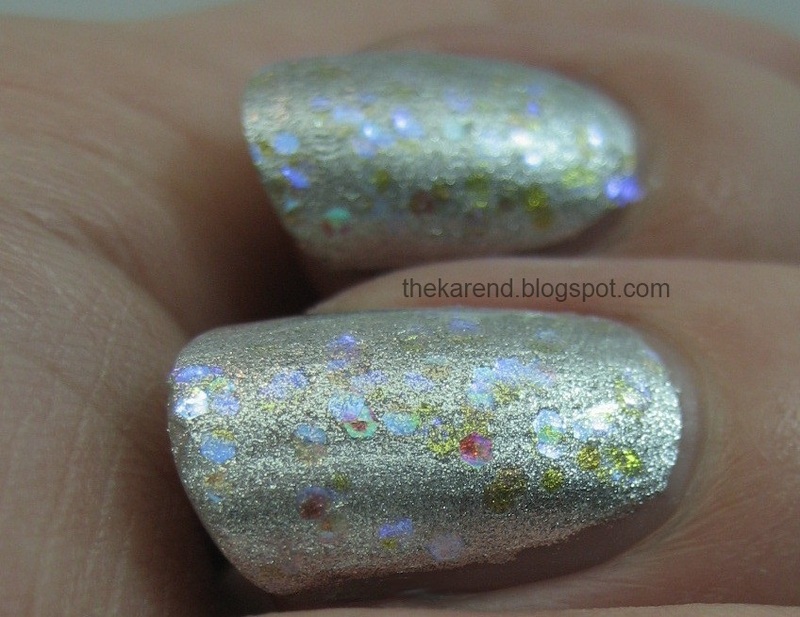 On the eight day of wearing these, they were still in pretty good shape but I was bored, so I turned to my old friend crack, China Glaze Crackle Glaze in Platinum Pieces to be specific. I slicked that on over the strips then added topcoat. I did this sitting in my car, so the photos aren't great (nor is my cleanup) but you get the idea. 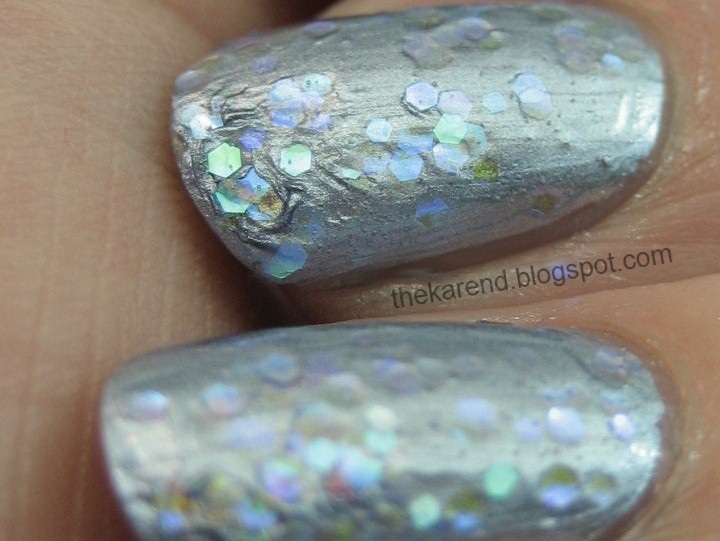 I really liked the silver crack blending with the silver base of the strips so there were just blips of color coming through. 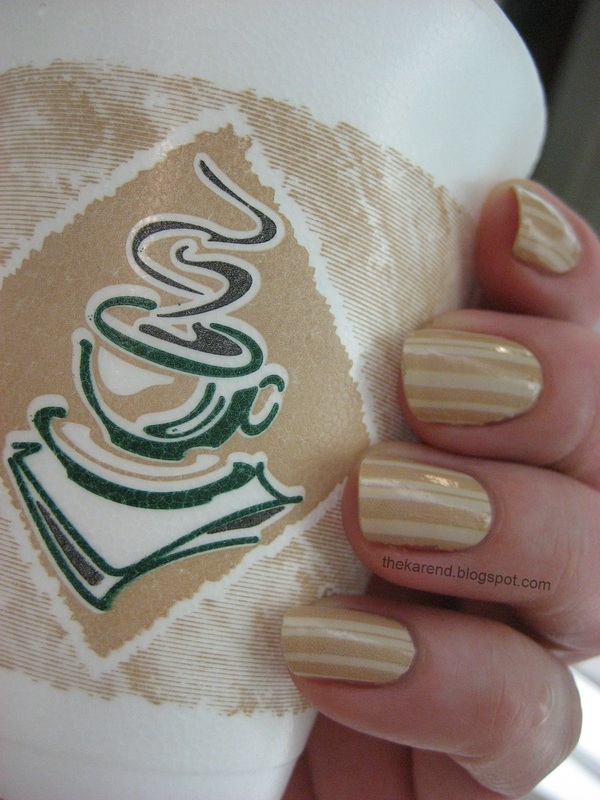 I haven't seen any new strip designs from Sally Hansen in a while, which surely means we're due for some. A new set of Halloween ones, maybe? Rite Aid was already starting to put out some Hallween stuff when I was there last week, so if Sally is on the same schedule we could see holiday strips soon. Also on the subject of strips, I'd like to say hey to Amanda from Fashion Footing, who saw a box of the Morning Glory ones, bought them, and asked if I wanted them, since she remembered I'd mentioned I wished I'd gotten more of that design. Of course I said yes, I wanted them. Thanks, Amanda!